Physics Buzz: How does an Earthquake in Japan cause a Tsunami in Hawaii? How does an Earthquake in Japan cause a Tsunami in Hawaii? This morning, an 8.9 magnitude earthquake struck off the coast of northern Japan, the strongest in its history. News is still coming in, but reports are that the earthquake and subsequent tsunami have devastated the region near it. Underwater earthquakes can be especially devastating because they sometimes create gigantic walls of water called tsunamis that can inundate coastal regions as far away as the other side of the ocean. Though it may feel like it's not moving, the ground under our feet is always moving very slowly across the planet. The surface of the Earth is made up of giant flat slabs called tectonic plates that float on top of the Earth's liquid core molten mantle. They're always moving around, pushed by currents of magma deep in the Earth's core. Right now North America is moving away from Europe at about an inch per year. The plates cover the earth's entire surface, and because they're constantly moving around, they're constantly bumping into each other. When two plates collide, it puts stresses on them. One usually starts to slide under the other one (this process is called subducting), which is how deep sea trenches are formed. The stresses build up and build up and finally something gives. The tectonic plate fractures at a point and vast stores of energy are released, causing the ground to shake violently. Last year's devastating earthquake in Chile moved the ground as much as eight feet in some places. This is why most earthquakes are more common in certain areas near a "fault line." The fault line is where two tectonic plates collide. Sometimes the plate shoots upwards, and if that happens underwater, it pushes the water up with it. This is a tsunami. As the wall of water falls back down to sea level, it creates a monstrous wave that radiates outwards at up to 450 miles per hour. The wave then travels across the ocean, but because it expands as it travels out, it becomes weaker as its energy is dissipated. The farther away one is from where the earthquake happens, called its epicenter, the less powerful the tsunami. Tsunamis are different than the normal waves seen at the beach. The ocean waves that surfers ride are made by blowing wind, rather than a tsunami that’s created from a geological event. It's not just earthquakes that can create tsunamis either; powerful volcanic eruptions can also send enough force into the water to create them as well. 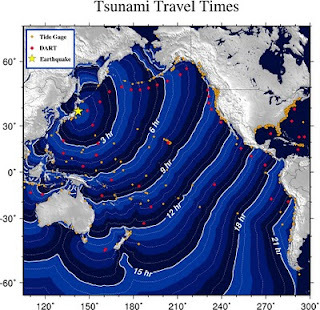 At the same time, not all underwater earthquakes will cause a tsunami. If the epicenter of the earthquake is deep underground, it might not push the Earth's surface up high enough or fast enough to create a tsunami. All of our thoughts are with the victims of this morning's earthquake. 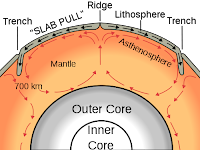 Not deep in the Core, But in the upper Mantle.Molten Plastic like matter undergoes convection currents and causes plates to move. ...And fixed! Thanks, good catch! Not directly relevant to the tsunami, but why are the tectonic plates large? Over the age of the earth, why have they not fragmented into lots of smaller plates? I can never find an answer to this in general discussions of plate tectonics and the earth.